Many of us struggle to get through the winter and we look forward to the summer months with a smile on our face. Although we may be looking forward to enjoying the warmer temperatures, those warm temperatures can also quickly get uncomfortable when the mercury rises. In fact, we may even find that we are wishing for the colder weather when it turns hot outside to that extent. If you are somebody that tends to struggle during the hotter months and would like a way to stay cool, the easiest way to do so is by using this unique DIY project. It is the perfect way to keep cool in the summer time, and you don’t even need a real air-conditioner to do so. In fact, you just use some simple products and turn a regular fan into a homemade air-conditioner. This is a great idea to keep in mind, especially if your AC goes out. Making your own air-conditioner using simple products may sound too good to be true, but it really isn’t. In fact, you can keep your entire family cool for a fraction of the cost that you would spend on air conditioning, including the electricity that air-conditioning uses. There are three separate parts that make this system work, a copper coil, ice water and a box fan. The icewater is pulled into the copper coil and it becomes freezing cold. 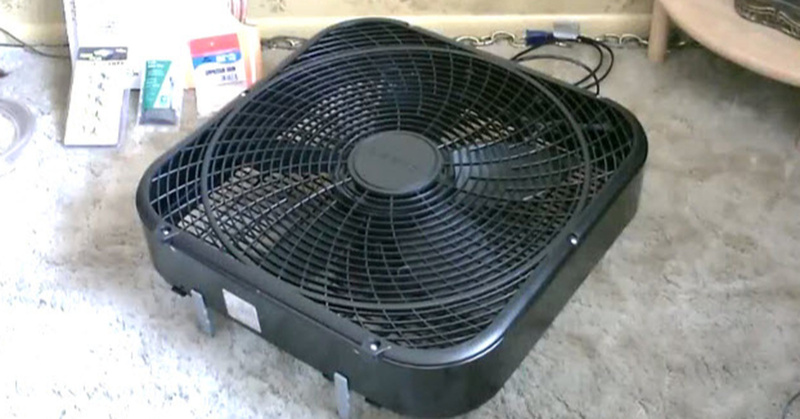 Since the box fan holds the coil, it blows freezing air over the copper coil and directly on to you. It only costs a few dollars, but it works fantastically. The only thing you need to do is continue to replace the ice when it melts away. Step 1: Lay out your box fan and start to slowly unravel the first copper coil on top. Step 2: Unravel the second copper coil. Zip tie both coils down. Step 3: Use the compression unit to connect the two copper coils. Step 4: Snip off the excess of the ties. Step 5: Attach the plastic tubing to the end of the copper coil. Step 6: Put the ice into a bucket and stick the end of the plastic tube into the ice water to get the cold air flowing.